Consider the entire dish, not just the protein. We’ve all heard the old rule: “white wine with fish and red wine with meat.” But that’s simply not true. When considering a dish to be paired with wine, it’s important to factor all of the ingredients as well as the preparation method, not just the protein itself. For example, you wouldn’t choose the same wine for a lightly poached chicken breast as you would barbeque chicken wings. The flavors are far too different even though they’re both chicken dishes. Know what makes a wine food-friendly. At the most general level, acid is what makes a wine pair well with food. That’s because acid acts a palate cleanser between bites. So how do you know if a wine has acid? If the sides of your mouth water when you drink it (like lemonade), it has acid. Unsure? Always turn to bubbly! When in doubt about a pairing, choose sparkling wine. Sparkling wines characteristically have high acidity and bubbles, that fizz is the result of the presence of carbon dioxide. That CO2 in the wine has a palate-cleansing capability that makes it perfect for pairing with food. Bubbly also can cut through rich and decadent foods, even very fatty foods such as fried chicken. What grows together goes together. Foods that are grown in the same regions where wines are produced will naturally go well together. This comes in especially handy when pairing European wine and food. Think about the region and what food is grown next to those grapes. Chianti, a spicy red wine from the Tuscany region of Italy, will go best with traditional Tuscan foods such as Pappardelle with a wild boar sauce. Think pink! 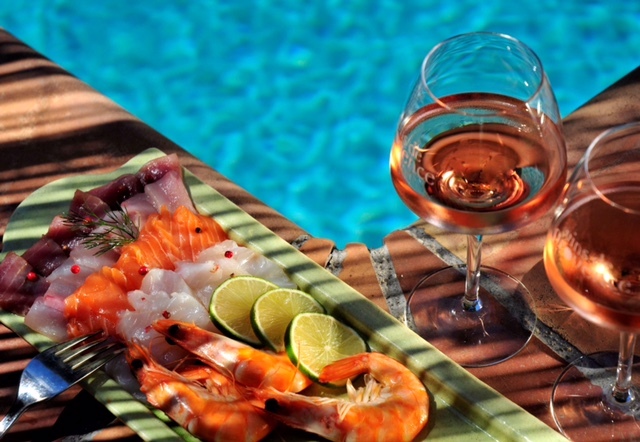 Rose is another great wine choice when in doubt because it goes with so many different types of foods. This is why it’s a good choice for meals where there will be lots of different styles and flavors, such as Thanksgiving. It’s also known as the wine that can bridge the gap between white and red wine drinkers because it’s somewhat in the middle itself. Want more information about pairing wine and food? 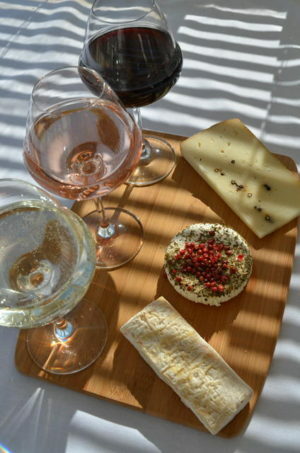 Download The Chopping Block’s new free Wine and Food Pairing Guide. It contains over 30 recipes for you to cook and wine suggestions that go with each. Consider it your homework for the fall!